Basset hounds were first bred in France from the dwarf dogs of bloodhounds and other various hound breeds in order to create a low to the ground hunting dog that could easily track the smell of fox and badgers. The Basset hound was first presented in a show in Paris, 1863. By the 20th century, two lines had been emerging, the straight legged hunters, and the crocked legged, droopy eared companions and show dogs. 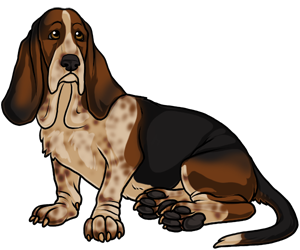 Today, the basset hound has a little of both traits in its breed standard and serves as both an effective hunting dog and loving companion. If the basset hound it overfed it may result in lameness and paralysis due to its short legs and long bodies. A man named Marquis de Lafayette is said to have brought basset hounds to the United States as a gift to George Washington. Early French bassets closely resembled a current French breed, Basset Artesien Normand.